People have an odd fascination for space aliens. While there have been some documented UFO sightings, there has been no solid evidence that extraterrestrials are using the things. Aliens are frequent subjects in New Age buffet-style religious prattling, where people claim to receive messages from them that promise great things for humanity. Of course, they're more "highly evolved" and much older than humanity, and reject God. Mixed with the fascination and hope is fear. The presupposition is that evolution happened on Earth, there must be multitudes of highly-advanced and more evolved alien civilizations out yonder — and they may not cotton to having us sharing the universe with them. Stephen Hawking is a famous physicist, but he's also an unbeliever and an evolutionist. He assumes that they are more evolved than us, and may be dangerous. Keep a low profile, humanity, and cool it with that SETI stuff, you savvy? War of the Worlds and Independence Day were almost documentaries, you know. Here is a contradiction in evolutionary thinking: as we've evolved, so has morality; some say that we get morality from evolution. From a secular view, does Hawking have a valid point? He is implying that evolution does not give people better morals, and is also implying the history of evolution, which is violence and "survival of the fittest". Hawking's concern is that aliens may be so far above us, we are to them like bacteria are to us, and can be eliminated without a second thought. Quite a bit of cogitating on "what if" stuff, based on the assumptions of deep time and evolution. Not only is there no substantial evidence for the existence of extraterrestrials, there is no real evidence of atoms-to-alien evolution, either. Everything was created by God, and that is the logical conclusion. No inference, no surmising. Time and again I am confronted with the view from young people that “Of course there are aliens out there. We can’t be the only ones.” This is a surprise to many of the older church folk in my acquaintance. However, CMI’s UFO authority, Gary Bates, indicates that in his experience belief in aliens can be found across all age groups—including churchgoers. Surveys estimate that more than 80% of Western peoples believe that ET is ‘out there somewhere’ which presumably encapsulates a lot of believers also.1 But many young folk in particular have been influenced by science fiction notions of aliens traversing the galaxy in their faster-than-light spaceships and advanced weaponry. And older folk are especially surprised to see that young people’s belief in extra-terrestrials often goes hand-in-hand with a morbid fear of what aliens will do to them. 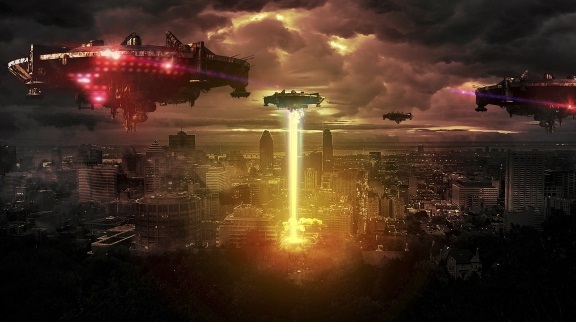 To read the rest of this very interesting article, click on "Hawking fear of aliens". You may also like a similar article that I wrote some time back, "A SETI-back for Evolution".